Ten days is not so long, really. In a lifetime, that is. But when you’re a kid and it’s summer and you’re on a small island in Maine, time stretches on and on, spinning out like an endless reel of fishing line cast in a perfect arc. Ten days is long enough to lie flat on your back in a hay-scented fern field, to crawl through the night woods after a porcupine, to watch an eagle disappear into the distance. It’s long enough to sit alone by the sea and watch dusk come down from an indigo sky. Ten days is long enough to change a life. Hog Island is a small place, just a mile and a half long, three quarters of a mile wide. It sits within shouting distance of the mainland not too far from Pemaquid Point. But when campers board the Puffin III and head across the narrows, manuevering past the rock at the end of the mussel bar, Muscongus Bay an expanse of watery sunlight to the east, they are making a journey to a fragile world, a granite-bound, 330-acre wildlife sanctuary on the edge of the Atlantic. Before 1981, there was no youth camp on Hog Island. 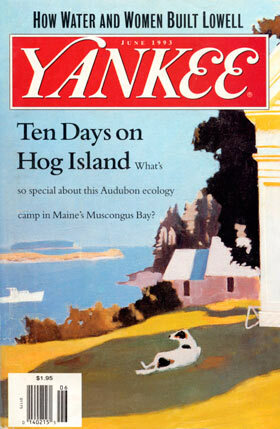 There were sessions for adults – had been since 1936, when Millicent Todd Bingham made the island available to be used as the first Audubon Nature Camp. Groups of adults, many of them teachers, came to the training center every summer to study with experts like Roger Tory Peterson, of bird guidebook fame. They took back to their classrooms, an increased knowledge of the natural world and an enthusiasm for preserving it. When the kids started coming, nothing changed much. There were no canoes, no sailboats, no tennis courts. Wasn’t even any swimming. “I went on record as saying, ‘Heck, this thing isn’t going to work,” says Joe Johansen, the camp’s much-loved warden who has been caretaking the place for 20 years. “But I was completely wrong.” There are still no canoes, sailboats, or tennis courts, but the kids come anyway. Every year the 50 slots in each session fill up three weeks after registration opens. And there’s always a long waiting list. They come, quite simply, because of the place. Hog Island is wild. It belongs to nature, except for the cluster of weathered buildings on the northern tip of the island, which houses the camp. The 19th-century clapboard farmhouse, now the dining room, was once part of a working farm that raised hogs. Despite its name, though, Hog Island is an ideal place to watch birds – and lots of other things. It’s a place where, thanks to six expert instructors who go, well, wild about nature, you learn to see things you’ve never noticed before. You get to peer through binocluars for puffins on Eastern Egg Rock or walk beneath a heron rookery. You get to creep along with a magnifying glass inches from the ground and follow a micro trail laid out with a piece of yarn, imagining you are an ant. On an island hike you see things up close – and touch them: the supple, sun-warmed curl of a garter snake, the prickly points of a sea anemone, tenacious rockweed growing on a giant boulder by the sea. When you are led, blindfolded, to a slender tree with peeling bark, you feel it with your hands; later you try and find it with your eyes. When a counselor shouts “Camouflage!” you learn to disappear in 30 seconds flat among the spruce needles and tree limbs dripping with grandfather moss. Every day there is more. On a dredging trip 150 pounds of living muck comes loose from the ocean floor for you to study. Or you can dig for clams and boil them for supper. You can sign up for low-impact camping or plod through a salt marsh. You can learn about algae and fungi, seals and seaweed, bats, squirrels, periwinkles – and fish. Don’t forget fish printing. First, each fish gets a colorful makeover using textile paint: a fire-engine red body, perhaps, with blue tail, brown fins, and a bulbous purple eye set in a neon green head. These are dream-like fish, spooky and fantastic, every scale distinct, every curve outlined in brilliant color. Once you’ve painted one – and printed it onto a white t-shirt – a fish will never be “just a fish” again. Even at night there are things to do. Campfires and singing. A hike through pitch black woods. Or you can sit on the dock and watch meteor showers. On a clear night, the whole star-filled sky gazes down on itself in Muscongus Bay. Run an oar through the water, and a cloud of phosphoresence shimmers beneath the surface, a bright cloud suspended in the dark ocean. Light overhead, light down below, you in the middle of it all – it’s hard to tell which way is up. All this in ten summer days, once, twice, maybe – if you’re really lucky – three or four times in your life. Ten summer days that cling to the memory like grandfather moss to a dead tree limb, like rockweed to a giant rock. Days that shimmer like a bright cloud of phosphorensence stirred up from the black bay in the middle of a dark summer night.